Essaouira provides the ultimate location for your kitesurfing holiday. It’s easy to travel to as there are many daily flights from Europe, it’s relatively cheap and there are a variety of conditions on your doorstep from a flat water lagoon to world class waves. There is everything on hand without the need of a car. You’ll find no shortage of wind and the main bay is very large with lots of space. You can experience the Moroccan culture with the interesting medina and I would say it’s a safe place too. I’m a typical Scottish lass with fair skin and fair hair but entering this Muslim country I did not feel afraid and/or intimidated as the people are friendly. In Essaouira there is wind almost all year round and the north easterly trade winds ensure this. In the summer the wind is more constant, but with a considerable increase in strength up to 40 knots, although overall the wind ranges from around 16-26 Knots. When I visited in June I went for 10 days and used 5m,7m and 9m kites! No need for big ones! The wind prevails from the right on a cross/cross onshore/cross offshore direction depending on what part of the bay you are kiting. The main area where the schools teach occupies a cross onshore wind indicating safeness. The weather is warm with a full sun blasting at around 30 degrees during the day. However, there is a wind chill factor and a sand blast factor which can be raw. Hardy people (like me) wore a shorty wetsuit but everyone else is recommended to wear full wetsuits around 3mm in thickness. The water is around 17-20 degrees but with the wind chill factor a wetsuit is suggested all year round. Everything in the town is closely situated so a car is not necessary. The kite beach is a 10 min walk from the medina in which most of the accommodation is located. The other hotels located along the beach front are even closer to the main bay. “Petite” blue taxis are around if needed. Furthermore, car rental is optional if you’d like to explore more sweet spots. However, the kite schools (Explora Morocco) regularly organise day trips to other spots nearby and downwinders too; they deal with all the logistics so I’d recommend just booking through them. You can find everything you need at the local markets! There are direct flights with Easyjet to Essaouira from London. Alternatively many other airlines provide flights to Marrakesh (2 hour drive) and Agadir (not much further than Marrakesh). The kite schools can easily organise transfers for you. Fun factor- look out for goats in trees on your drive. There are lots of options for traditional and international cuisine. There are fabulous fish and fruit/veg markets for the self-catered, cheap takeaways with traditional shawarmas to high end French cuisine. I personally love the avocados from the market, they’re super delicious and extremely cheap! On the beach for lunch and snacks there is one main restaurant called Ocean Vagabond where you can find Wi-Fi, international types of food and drinks and a good relaxed chill out vibe. For drinks, many restaurants are not licensed to sell alcoholic drinks due to being a Muslim country. However, some do, it’s just a question of asking when you arrive there. There is a bottle shop which is hilarious and always seems busy! Just be careful if you are visiting during Ramadan as it can be more difficult if you fancy having a few beers. Essaouira is not a clubbing destination but there are a couple of great live music venues that stand out. For example, Megaloft and Taros. You can watch the amazing sunsets here too (in Taros on the top balcony). Holly enjoying the conditions of Essaouira Main Beach. There are many different other things to do! Being a wave spot you can go surfing and SUPing. You can even go horse and camel riding, a novelty factor, or shopping in the markets, look out for classic Moroccan rugs, Moroccan tea and teapots and argon oil. Wi-fi is widely available, although strolling through the medina you could imagine being in biblical times. There’s a variety of choice from the unique character of rhiads, private and/or shared, hostels and hotels. Rhiad’s are the best way of experiencing traditional Moroccon medina living. The rooms are built around a central courtyard. I stayed with Explora and Kiteworldwide in a rhiad that offered B&B with private or shared rooms. The locals are friendly too! Enjoying the place to herself! The hustle and bustle of the local market! Holly Kennedy is from Scotland an is a full time student alongside being a professional kitesurfer. She participates in freestyle and wave riding competitions and loves to travel checking out different kite spots. 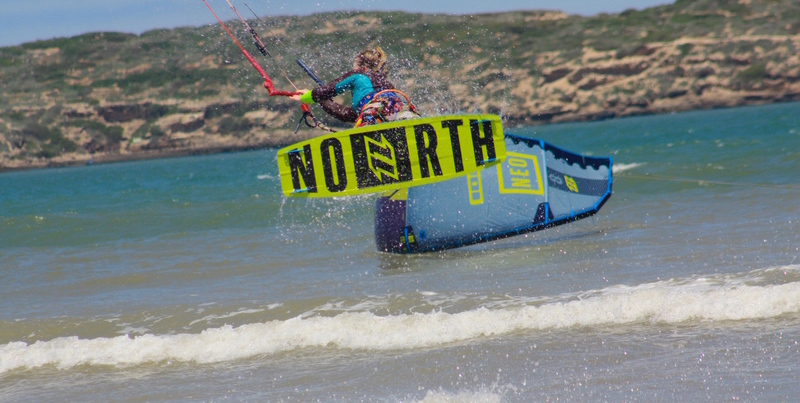 She is supported by North Kiteboarding and ION. Been to Essaouira? What did you think? 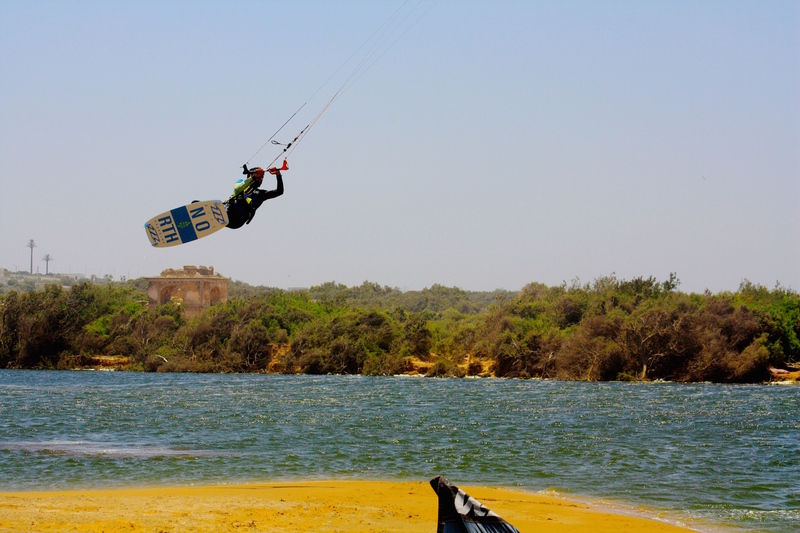 Where are the Best Kitesurfing Beaches in Essaouira? Essaouira Main Beach is a large sandy beach where most activities takes place. The water state is choppy with some good waves on the left side when you look out to sea. There’s plenty of space on this beach so you don’t have to worry about crashing into anyone! The lagoon is located just south of the main beach. It is located at a river mouth so it varies in depth every day, week, month and year. The lagoon is pretty small so around 6 kiters makes it busy! When is the Best Time to go Kitesurfing in Essaouira? We take a look at the excellent kiting spot of Essaouira and prove you go somewhere a little bit different for less than you think.